Urinary retention is as an inability to pass urine. It can be divided into either acute or chronic urinary retention. Acute urinary retention is defined as a new onset inability to pass urine*, which subsequently leads to pain and discomfort, with significant residual volumes. The condition is most prevalent in older male patients, typically due to an enlarged prostate leading to bladder outflow obstruction, however there are a wide array of potential causes. Patients with chronic retention can also enter acute retention, either as an acute deterioration of the underlying pathology causing their chronic retention or a new aetiology superimposed on a background of chronic retention. These patients will present often with minimal discomfort, despite very large residual volumes. They should be treated as per acute retention management, however may have much higher residual volumes than other acute retention patients, therefore more at risk to post-obstructive diuresis. The most common cause in men is benign prostatic hyperplasia (BPH). Other common obstructive causes include urethral strictures or prostate cancer. Urinary tract infections can cause the urethral sphincter to close, especially in those with already narrowed outflow tracts (e.g. BPH). Constipation can also cause acute retention, through compression on the urethra. Severe pain can often cause patients to enter acute retention. Medications, such as anti-muscarinics or spinal or epidural anaesthesia, can affect innervation to the bladder, resulting in acute retention. Neurological causes can include peripheral neuropathy, iatrogenic nerve damage during pelvic surgery, upper motor neurone disease (such as Multiple Sclerosis Parkinson’s disease), or Bladder Sphincter Dysinergy*. Patients will present with acute suprapubic pain and an inability to micturate. This may be associated with symptoms suggestive of the predisposing cause, such as a urinary tract infection, change to medication, or worsening voiding LUTS. On examination, the patient will have a palpable distended bladder, with suprapubic tenderness. Any associated fevers/rigors or lethargy may suggest an infective cause. Ensure to perform a PR examination, especially in elderly patients, to assess for any prostate enlargement or constipation. A post-void bedside bladder scan will show the volume of retained urine, helping to confirm the diagnosis. All patients require routine bloods, especially a FBC, CRP, and U&Es . Post-catheterisation (see below), a CSU (Catheterised Specimen of Urine) should also be sent to assess for the presence of infection. 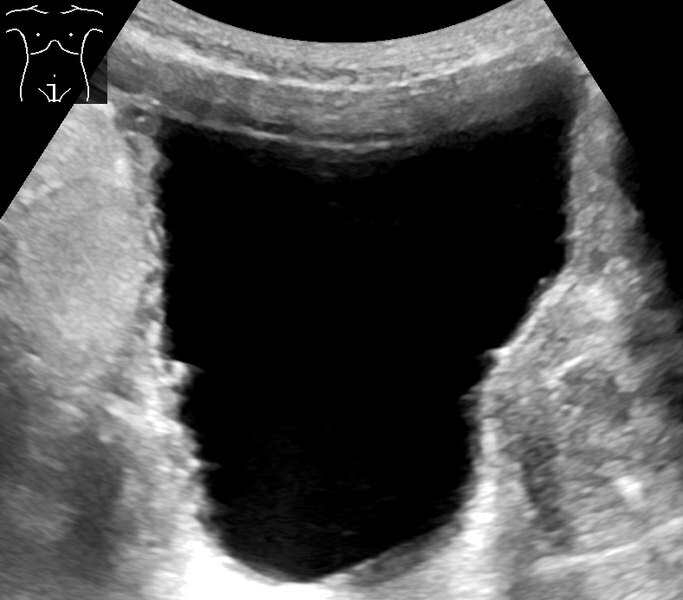 Patients with features of high-pressure retention (see below) will require an ultrasound scan of their urinary tract to assess for the presence of associated hydronephrosis. If this is confirmed, follow-up repeat imaging will be required in the subsequent weeks following treatment of the retention, to ensure its resolution. High Pressure Urinary Retention refers to the urinary retention causing such high intra-vesicular pressures that the anti-reflux mechanism of the bladder and ureters is overcome and ‘backs up’ into the upper renal tract leading to hydroureter and hydronephrosis, impairing the kidneys’ clearance levels. Such patients present in retention with associated deranged renal function, and hydronephrosis will be subsequently confirmed on imaging (typically ultrasound as first line). Repeat episodes of high-pressure chronic retention can cause permanent renal scarring and chronic kidney disease (CKD). By contrast, low pressure retention occurs in patients with retention with the upper renal tract unaffected due competent urethral valves or reduced detrusor muscle contractility / complete detrusor failure. Patients will warrant immediate urethral catheterisation to resolve the retention. Ensure to measure the volume drained post-catheterisation. The underlying causes should then be treated accordingly. For patients with an enlarged prostate, appropriate medication (typically Tamsulosin, an alpha receptor antagonist) should be started if suitable. Ensure to check the CSU for any evidence of infection and treat with antibiotics if needed. Review the patient’s medication for any potential contributing causes and treat any constipation if present. Patients who have a large retention volume (arbitrarily around >1000ml*) need to be monitored post-catheterisation for evidence of post-obstructive diuresis. Following resolution of the retention through catheterisation, the kidneys can often over-diurese due to the loss of their medullary concentration gradient, which can take time to re-equilibrate. This over-diuresis can lead to a worsening AKI. Consequently, those patients at risk should have their urine output monitored over the following 24 hours post-catheterisation. Patients producing >200ml/hr urine output should have around 50% of their urine output replaced with intravenous fluids to avoid any worsening AKI. Patients who have high-pressure urinary retention will have to keep their catheters in-situ until definitive management can be arranged (e.g. TURP), due to risk of further episodes of urinary retention causing AKI (which may lead to renal scarring and CKD). If patients have no evidence of renal impairment, a TWOC (Trial WithOut Catheter) will be attempted, whereby the catheter is removed 24-48hrs after insertion. If the patient voids successfully, with a minimal residual volume, the TWOC is considered successful, whilst if the patient re-enters retention, the patient will require re-catheterisation. 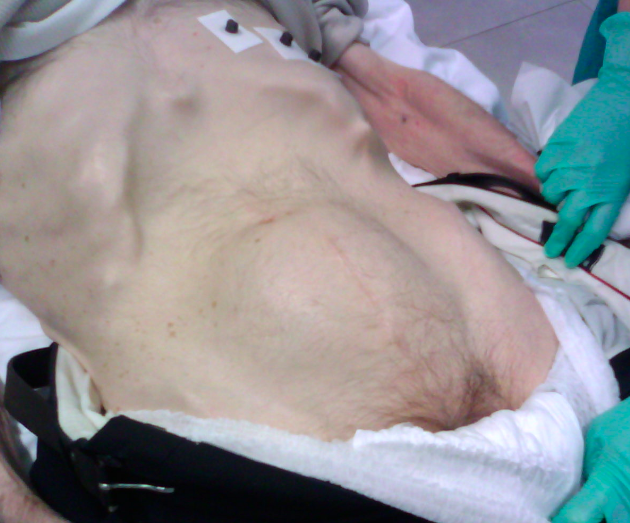 Further TWOCs can be attempted (typically following a longer interval and preferably in a specialist TWOC clinic), however multiple failed attempts may warrant a long-term catheter, until definitive management can be arranged to treat the underlying cause. Acute kidney injury, which can lead to chronic kidney injury if multiple episodes of retention leading to renal scarring. Other complications include increased risk of urinary tract infections and renal stones due to urinary stasis. Acute urinary retention is defined as a new onset inability to pass urine, which subsequently leads to pain and discomfort, with significant residual volumes. What receptors provide the main parasympathetic supply to the bladder? What medication can be trialled for long-term control as first line in males in acute urinary retention secondary to BPH? A patient presents with 600ml in AUR and has no evidence of renal impairment of his bloods, after what time period can a TWOC be trialled? For a patient presenting with AUR with renal impairment, what imaging modality should be arranged?